The second phase will be the actual building of the pod prototypes to compete on a one mile track SpaceX will be building adjacent to its Hawthorne, California headquarters. The company expects the track to be completed in June 2016, but the exact date of the competition is to be announced. Spacex revealed general guidelines for the Design Weekend and in August they will reveal more details for the competition. The company specified that neither them or Musk have any affiliation with the two private companies developing their own Hyperloop projects: the very confusedly named Hyperloop Technologies, Inc (HT) and Hyperloop Transportation Technologies, inc. (HTT). HT is a company founded by Uber investor Shervin Pishevar and former SpaceX engineer Brogan Bambrogan, while HTT is a crowdfunded open-source company. Musk confirmed via Twitter that SpaceX and Tesla will build their own pod prototype outside of the competition and the project should be presented parallel to the event. SpaceX/Tesla will also do a reference pod to be shown after the @Hyperloop competition. Bonus for all racing teams that exceed reference. 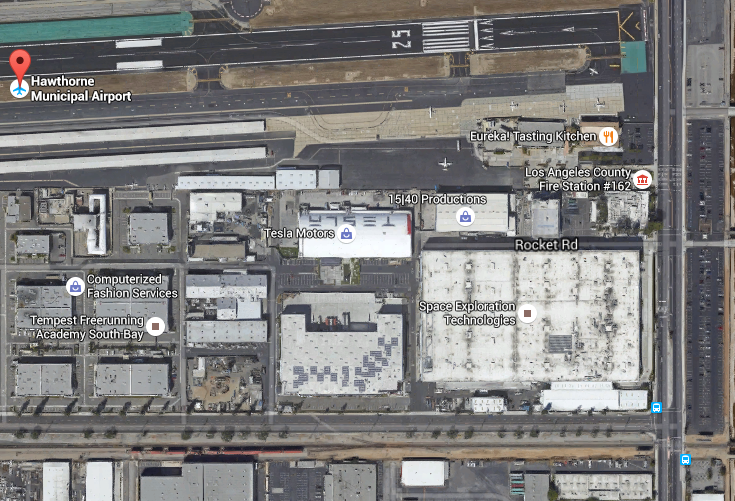 SpaceX’s headquarters are located along the Hawthorne Airport near Los Angeles. The track will have a diameter between 4 and 5 feet according to the guidelines released by SpaceX. It’s not clear exactly where the track will be located in this very urban landscape. In January when Musk first announced his intention to build a Hyperloop test track, he said it was likely to be located in Texas, but back then he was talking about “a loop of around 5 miles”.